All this is available in LibreOffice master (towards 6.3), so you can try it out right now, if interested. In this post I would like to present the progress done earlier this year regarding the above mentioned diagram types — these are used in many documents. Organization Chart is the most complex type I dealt with so far. I fixed several issues (font color, vertical ordering, multiple paragraphs in a data node, size of layout nodes, better support for hierBranch conditions, the type of connector shapes). This allows giving readable result for diagrams which are more complex than the simple 3-node one presented in the previous post. Cycle Matrix: there were missing child nodes here, the composite algorithm needed improved handling of position / size from constraints and the ordering / fill / line properties of actual content also needed fixing. Picture Strip: the biggest problem here was the lack of pictures, but also the existing snake algorithm needed improvements (size, positioning, spacing and margins of the child shapes were not great). With all these fixed, we reach a much better state for the mentioned diagram types. The SmartArt test documents from sd/qa/unit/data/pptx/ is what I used for testing this work. This is not not perfect yet, but it’s clearly a large improvement, all text is now readable from the diagrams and pictures are no longer missing! As mentioned in my previous such report, a hack week is when we are allowed to hack on anything we want in LibreOffice for a few days at Collabora. I used this time to implement core support for the btLr text direction in Writer. 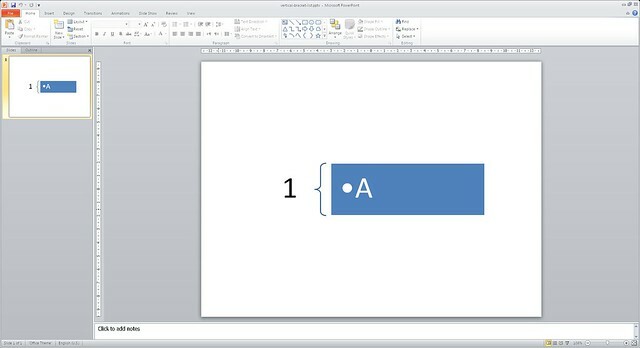 If you work with tables in Word, it’s very easy to create this writing direction: the context menu in a table cell has a menu item to set the direction of the text, where you can rotate the text by 90 degrees counter-clockwise or clockwise. The counter-clockwise btLr direction is the problematic one. Support for tbRl was fine already, since that is needed typically for Chinese/Japanese scripts as well. You can see how the second paragraph in the cell was missing from the rendered result and now we basically pixel-by-pixel match the reference. Mongolian (top to bottom, left to right) text. This new one is also a vertical direction, also left to right, but bottom to top. The initial layout contained code to read the new enumerator from doc model, extend the SwFrame class to handle this new bottom to top mode, some handling of switching between horizontal/vertical mode and at the end mapping from Writer layout’s direction to VCL’s "900" font orientation. There are more things to handle in layout, but this was good enough to look at other areas as well. The ODF filter required updating, which was a bit challenging as it was necessary to write different attribute names depending on which enumerator is used from an emumeration, and we don’t have good support for this. Once the filter code was in place, I could write some layout-level tests as well. Since we have .ui files for UI descriptions, adding UI support was really easy. Time came to step away from coding for a moment and write up paperwork to propose this feature to be part of the next ODF version (thanks to Andras for the help there!). Which allows seeing the differences between our and Word’s PDF output. Additional work was needed to handle multiple paragraphs in a table cell. At this stage I was happy enough with the rendering result, so finally pulled the trigger and replaced the old DOCX filter hack (using character-level rotation) with simple DOCX filter mapping from OOXML’s btLr direction to Writer’s btLr direction — i.e. what was already done for the tbRl case. the ODF proposal has a list of contexts other than table cells where the new writing direction could be used, which lack UI/filter support/etc at the moment. In this post I would like to present the progress done last month regarding the above mentioned diagram types — these are used in many documents. Continuous Block Process now reads space width from constraints. Accent Process now has the missing bullets and fixes an incorrect large paragraph-level indent. Organization Chart now has an initial implementation of the hierRoot and hierChild algorithms. Organization Chart now handles multiple employees for a manager. This is not not perfect yet, but it’s clearly a large improvement, all text is now readable from the diagrams and bullets are no longer missing! 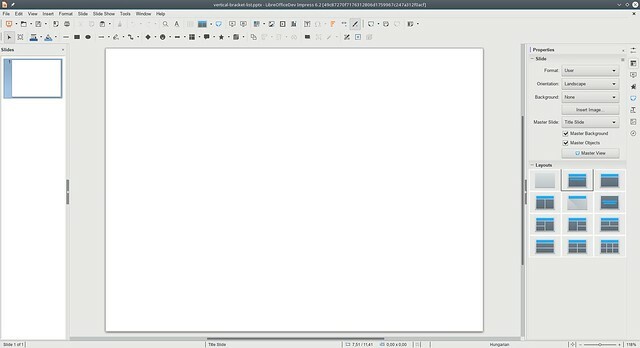 I recently dived into the SmartArt support of LibreOffice, which is the component responsible for displaying complex diagrams from PPTX. I focused especially on the case when only document model and the layout constraints are given, not a pre-rendered result. In this post I would like to present the progress regarding the Accent Process preset, available in PowerPoint — which is used in many documents. Values are not read from constraints (there was a reason for this, they can be complex, given that depending on the context, the unit is points or millimeters and the unit is always implicit). Linear algorithm did not take size from constraints when it came to recursing into child algorithms. Data point assumed that all text for it is a single "run" (i.e. either all text is bold or nothing, not half of it). followSib axis was not implemented for forEach, so when you have arrow shapes between objects, we created N arrows, not N - 1 ones. Connectors were created as invisible shapes and had the wrong width/height aspect. With all these fixed, we reach a much better state for handling accent process. smartart-accent-process.pptx is what I used for testing of this work. This is not not perfect yet, but it’s clearly a large improvement, all text is now readable from the diagram! 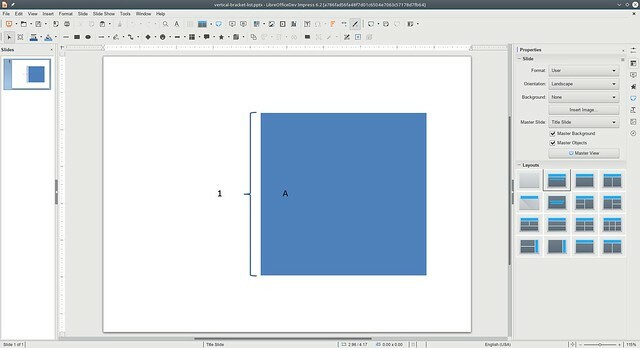 I recently dived into the SmartArt support of LibreOffice, which is the component responsible for displaying complex diagrams from PPTX, especially in case only document model and the layout constraints are given, not a pre-rendered result. There are several ones. 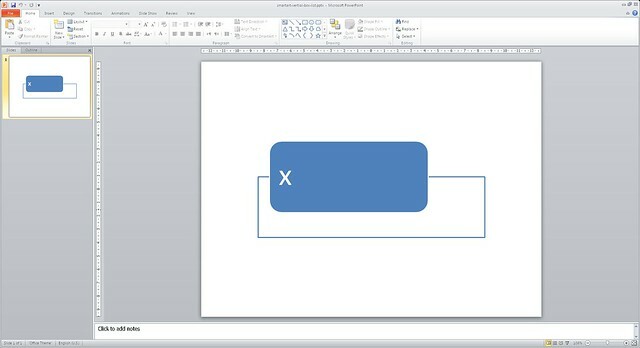 :-) If you are just interested in high quality viewing of PPTX files, then your problem started with PowerPoint 2007 not writing a pre-rendered drawingML markup of the diagram to the files, only PowerPoint 2010 started behaving like this. Additionally, if a diagram is not edited, then re-saving with PowerPoint 2010 doesn’t seem to generate the drawingML markup, either. This means that data + constraints cases are quite frequent even today. Also, one day Impress should be able to actually edit these SmartArts as well, so having the knowledge how to lay out SmartArt (even if it’s import-time-only at the moment) is a good thing. I always write cppunit tests when I work on filter code (in this case OOXML), so far all fixes were visible in just two test files: smartart-vertial-box-list.pptx and vertical-bracket-list.pptx. Clearly the results are not perfect yet, but in both cases nothing was visible, and now all text is readable, so we’re moving in the right direction! 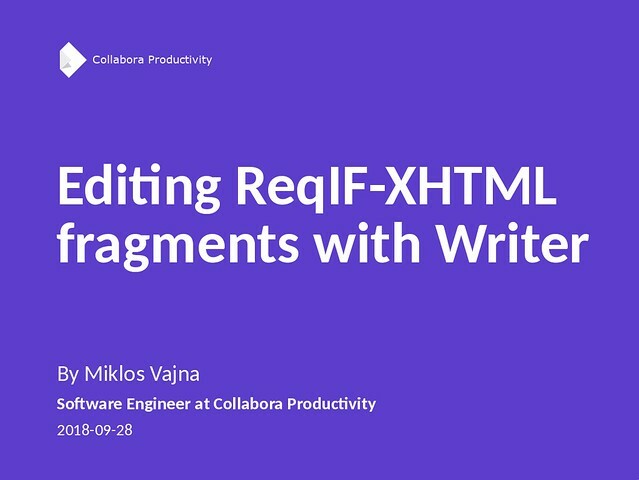 Last Friday I gave a Text layout performance lightning talk at LibreOffice Conference 2018. Click on the image to get the hybrid PDF slides! I expect quite some other slides will be available on Planet, don’t miss them. 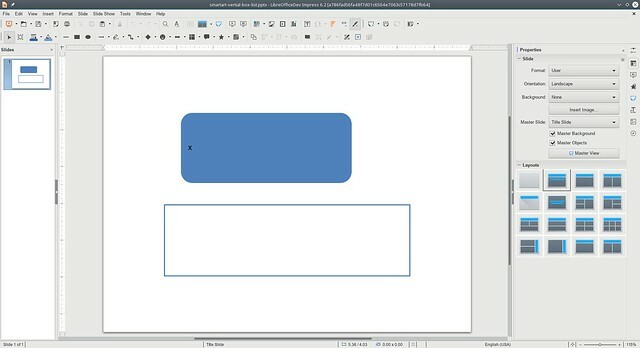 I worked on two small features to extend the public (UNO) API of LibreOffice. First, thanks to Vector for funding Collabora to make this possible. The UNO API of Draw allows you to build quite complex and custom shapes, but you may want to export the rendered result to a bitmap for testing purposes, so you can assert that the actual result matches a reference one. One problem in this area is anti-aliasing, which can easily differ between machines. Given that normally aliased rendering is ugly, there is now a way to enable AA, but disable it just during a single invocation of the PNG exporter. This feature is available for other bitmap formats as well, PNG is only an example. In most cases you don’t really need a default character style: if you’re fine with a default, then the default paragraph style should be enough for your needs. In general, paragraph styles can contain character properties, so if the default is fine for you, you just don’t set a character style. However, there is an exception to all rules. If you want to reset the current character style, it makes sense to just set the CharStyleName property to a default value, especially since this works with paragraph styles already. And it’ll be handled as Default Style in English builds, or their localized versions in a non-English UI.